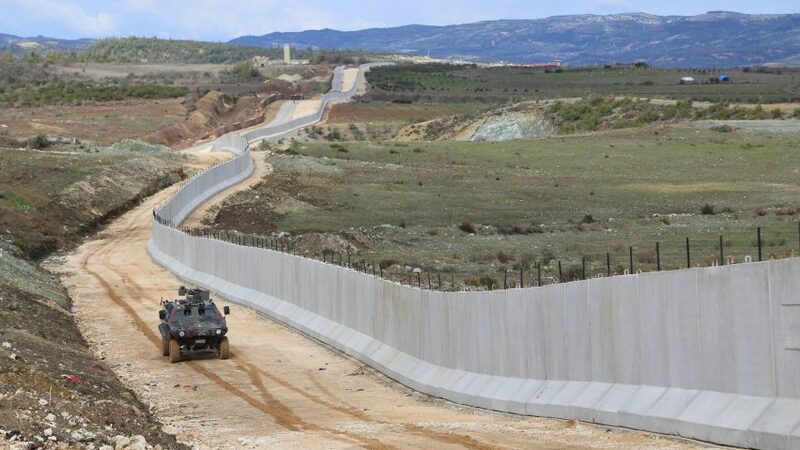 As Donald Trump prepares to build a wall between the USA and Mexico, Turkey has announced the completion of a three-metre high fortification along its border with Syria to prevent refugees and smugglers entering the country. The completed 556-kilometre section is the first phase of a structure that will eventually seal the entire 911-kilometre border between the two countries. The rest of the wall is due to be completed by the autumn, at which point it would be the second-longest structure in the world, after the 3,460-kilometre Great Wall of China. Humanitarian expert Killian Kleinschmidt said he saw the wall first hand on a visit to Gazientep in southern Turkey last week. "You see it running through the mountains, up and down," he told Dezeen. "It's really wow. Nobody gets across the border now without the Turks saying so. The Turks are very proud. Trump would love it." Kleinschmidt, founder of humanitarian consultancy Switxboard, said that the wall, together with new barriers along Syria's borders with Lebanon and Jordan, had effectively ended the mass exodus of refugees fleeing Syria's civil war. "They have made Syria into a very big prison," he said. "Lebanon has closed its border more or less. There's no wall but it's close to being one. Jordan has an earth berm and is using American technology such as night-vision stuff to close its border and nobody gets across." The measures meant that the outflow of Syrian refugees has "more or less finished," Kleinschmidt said. It is estimated that over five million Syrians have fled to neighbouring countries since the onset of the civil war in 2011, with almost three million of them seeking asylum in Turkey. Lebanon and Jordan have the next highest refugee populations, with registered numbers standing at one million and 600,000 respectively, although actual figures may be far higher. The Turkish border wall is comprised of modular concrete blocks each weighing 14 tonnes and is topped by 60 centimetres of razor wire, according to Turkish newspaper Yeni Safak. The paper said that the blocks were produced by contractors including Toki, a state-run social housing provider. Turkey's border with Syria, which was drawn up after the collapse of the Ottoman Empire at the end of the first world war, starts south of Antakya on the Mediterranean coast. It extends roughly eastwards through the hills of Upper Mesopotamia, across the Euphrates river, and ends at the point where the Tigris river enters Iraq. When complete, the fortification will also include 67 reinforced defensive towers, 67 watchtowers and around 100 kilometres of illuminated sections. At 1,600 kilometres in length, Trump's wall will eventually beat the Turkish wall into second place as the world's longest. The Israeli West Bank barrier, under construction between Israel and the West Bank, will be 650 kilometres long when complete. Earlier this year graffiti artist Banksy opened a hotel called Walled Off alongside the section of the barrier that passes through Bethlehem. Killian Kleinschmidt, a former director of the United Nations High Commission for Refugees, was previously director of the Zaatari refugee camp in Jordan. In an interview with Dezeen in 2015, he described refugee camps as "the cities of tomorrow" and called for an overhaul of aid-based strategies to humanitarian crises. Instead, he believes the entrepreneurial spirit of refugees should be encouraged so they can solve their own problems. Last year Kleinschmidt contributed to the Refugee Cities report, which proposed turning camps into enterprise zones. Earlier this month IKEA announced that it was setting up production centres in Jordan to employ refugees, as part of a strategy to help 200,000 people out of poverty.